The 42-year old Hidden Hollow Landfill is nearing the end of its designed capacity. When it reaches its design-capacity, Ada County will close the facility according to state and federal requirements. 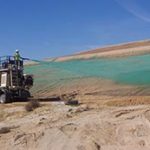 (Boise, ID) – This week, the Ada County Landfill Hidden Hollow cell is undergoing hydroseeding – the final stage of its Phase II closure process. 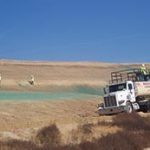 The hydroseeding is being performed as the Hidden Hollow landfill cell’s phase II “capping” process wraps up. Capping involves a lengthy and expensive process, which takes place in phases in order to give the cell an opportunity to rest and settle along the way. In 2001, the first phase of closure consisting of roughly forty acres was completed on Hidden Hollow. This year, the Hidden Hollow cell entered its second phase of closure, in which the cell was capped with a thick layer of soil excavated from the landfill property. This soil cap covers the waste cell to help control odors, and along with the hydroseeding process, will facilitate re-vegetation of the area with native plant species. The second phase of closure came at a cost of just over $1.8M and has taken nearly five months to complete, with the aid of contractor Knife River. Knife River’s work consisted of laying over 200,000 cubic yards of cover and topsoil, stormwater collection improvements on slopes, and reseeding the area with native vegetation. This cover and topsoil reaches more than five feet in depth and covers nearly twenty-five acres of the Hidden Hollow cell. The Hidden Hollow cell is now approximately two-thirds capped, as the cell has roughly thirty additional acres yet to be covered, and is capable of accepting approximately 400,000 more cubic yards of waste before it reaches full capacity. Creating new landfill space is very expensive, so in order to get the most out of Ada County’s existing resources, procedures for the final closure of the remainder of the Hidden Hollow cell will commence once it reaches its designed capacity. Hidden Hollow will continue to produce landfill gas for many years, and will continue to be maintained by the county for a minimum of thirty years after its final closure.